Harry Maguire, aka ‘Slabhead’ to his Leicester City teammates was great for England at the World Cup, Manchester United wanted him. But he stayed loyal to Leicester City and signed a new £80,000-a-week-deal, not too shabby but still less than a desperate Man United would have paid him. Last night in England’s 1-0 win over a limited Switzerland at Leicester City’s home ground, the Mail rated Maguire the third best England player on the pitch, awarding him 6.5 out of 10. He was “England’s most assured defender”. 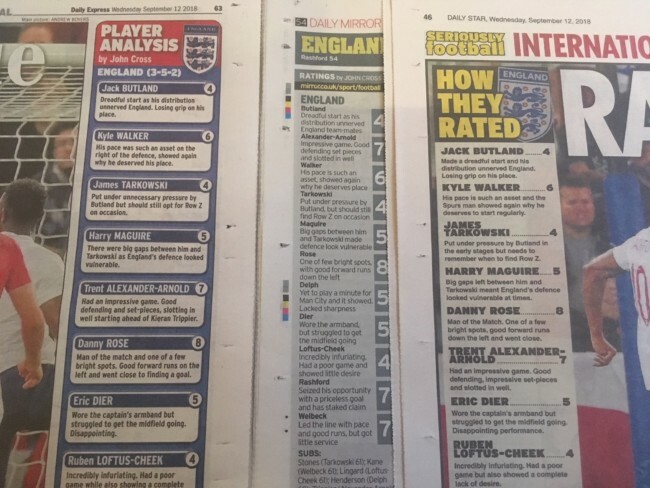 Over at the cost-saving Daily Mirror, which now owns the Daily Express, and Daily Star the verdict was unanimous: “HARRY MAGUIRE – 5: Big gaps between him and Tarkowski meant England’s defence looked vulnerable at times.” Which newspaper survives this copy and paste approach to journalism remains to be seen (maybe they’ll be sold in bundles; buy one get the other two free?) – but the least the Mirror and Express attributed the comment to John Cross, whereas the Star omitted to name any writer.